Critical Care of Children with Heart Disease will summarize the comprehensive medical and surgical management of the acutely-ill patient with congenital and acquired cardiac disease. 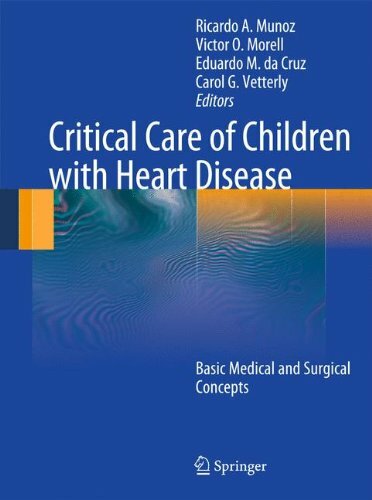 The aim of the book is to teach bedside physicians, nurses and other caregivers, basic and practical concepts of anatomy, pathophysiology, surgical techniques and peri-operative management of critically ill children and adults with congenital heart disease, allowing these professionals to anticipate, prevent or else treat such pathologies. The book will cover specific cardiac lesions, review their anatomy, pathophysiology, current preoperative, intraoperative and postoperative assessment and management; medical and surgical complications will be briefly described with each lesion further discussed in specific chapters. In addition, the book will have dedicated chapters to management of cardiac patients on extracorporeal membrane oxygenation, hemofiltration, hemo or peritoneal dialysis and plasma exchange. Practical guidelines for cardiovascular nursing care will be also included.